Activists have accused Beijing of putting more than a million Uighurs in detention camps with a goal of destroying their ethnic identity. China has said the camps are vocational education centers aimed at stopping the spread of religious extremism. Sam Brownback, the U.S. ambassador-at-large for international religious freedom, said the Chinese government's actions against the Uighurs amount to a war with faith which, he added, China will not win. Brownback made his comments at a reception on Monday and called on Congress to protect international religious freedom and the human rights of Uighurs. FILE - Sam Brownback, U.S. ambassador for religious freedom, speaks during "A Civil Society Dialogue on Securing Religious Freedom in the Indo-Pacific Region" forum in Taipei, Taiwan, March 11, 2019. He said he had seen reports that China may have put legal residents of the United States in detention camps in the province-like Xinjiang Uighur Autonomous Region. Media reports of such detentions have not been confirmed. The ambassador told VOA's Mandarin Service that the United States has a great deal at stake, whether legal U.S. residents are being detained or not. 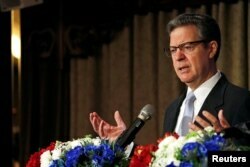 "You've got, really, an aggressive police state that the Chinese have put in place with ubiquitous cameras, with artificial intelligence systems behind it, with people being locked up in internment camps," Brownback said. "This is, in and of itself, enough, but if they're also United States legal residents there, it raises the stakes even further," he said. "What the Chinese government is doing is wrong. They should not do it. They're at war with faith. It is a war they will not win. And we're going to press back hard against that taking place." The Chinese Embassy in Washington, D.C., did not respond to requests for comment. FILE - Workers walk by the perimeter fence of what is officially known as a vocational skills education center in Dabancheng in Xinjiang Uighur Autonomous Region, China, Sept. 4, 2018. Democratic Congresswoman Jackie Speier, co-chair of the Congressional Ahmadiyya Muslim Caucus, told VOA the U.S. government needs to do more to push the Chinese government to change its behavior. "This whole issue has got to be addressed on the highest levels of the U.S. government," Speier said. "I feel that we have really not done our job in terms of highlighting what's going on with the Uighur population in China," she said. "It's time for us to speak loudly and clearly about how this has all the makings of yet another genocide." Democratic Congressman Raja Krishnamoorthi said the United States should raise the issue on a bilateral basis. "I think that the Chinese government is engaging in massive persecution of this Muslim community. 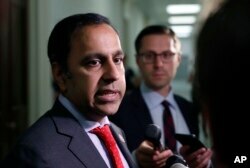 And I believe that we have to speak up now for their rights and their dignity and their freedoms," Krishnamoorthi said. FILE - House Oversight Committee member Rep. Raja Krishnamoorthi, D-Ill., speaks on Capitol Hill, June 27, 2018. The reception was part of the annual "Day on the Hill" event for Ahmadiyya Muslims in the United States. Every year, the community chooses a day to summon Ahmadiyya Muslim volunteers from all over the U.S. to meet lawmakers on Capitol Hill, calling on them to protect international religious freedom for all people. Amjad Mahmood Khan, national director of public affairs for the Ahmadiyya Muslim Community USA, said this year's event focused on the human rights situation of Muslims in Xinjiang, with 125 volunteers and Uighur Muslims from more than 30 states visiting the offices of more than 200 U.S. lawmakers. "We feel that we should be very clear that all people should have basic minimum human rights, the right to have freedom of conscience, not to be deprived of their conscience, not to be detained unfairly, the right to a free trial. And these things are really causing problems for Uighurs in China," Khan said. 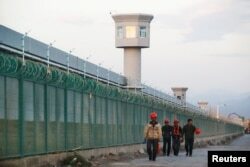 Rushan Abbas, director of the Campaign for Uyghurs, a human rights group, said she has relatives being held in detention camps by the Chinese government. She hopes the U.S. government will take action to help the detained Uighurs. "The United States government should take action, and using the Global Magnitsky Act, should sanction the Chinese officials who are responsible for this atrocity," Abbas said. The act "allows the executive branch to impose visa bans and targeted sanctions on individuals anywhere in the world responsible for committing human rights violations or acts of significant corruption," according to Human Rights Watch.